Readers sound off on the true nature of skateboarding, the Peralta Colleges, and local sports teams. I am disappointed in your reference to skateboarding as a "sport." 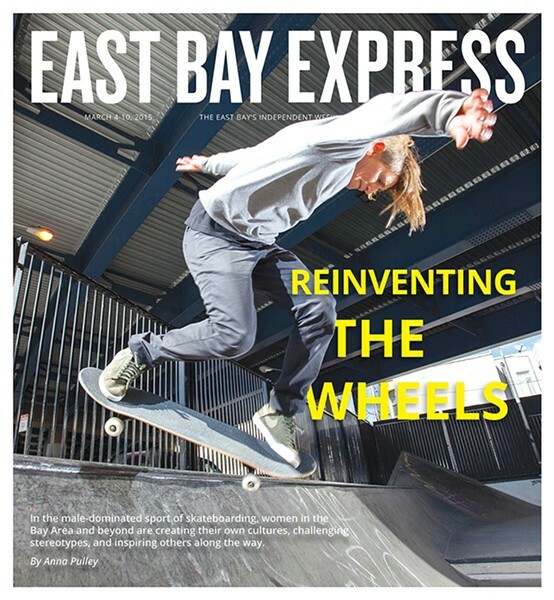 You could have used the word "culture" but instead, on the title page of your paper, you gave in to the Tony Hawk enterprise and X-Game-ification of skateboarding despite being based so close to such a historically key location of something that has had such a great impact on people's lives. I hope you do not overlook such a thing in the future. What is going on in this particular district is not unknown throughout the whole community college system here in California and elsewhere in the nation. "Equal pay for equal work" is our mantra, and sooner rather than later, we are going to collect on it! Full-time faculty and administrators hold our collective lives in their greedy hands and will stoop to bullying and crass intimidation to try to silence us at every turn, from denying us classes we have taught (and taught well) for years to allowing hapless and neglectful full-timers who cannot make their enrollments on their own to abscond with our classes at the last moment. Overload indeed! It's nothing short of theft. The rules and regulations that we did not have anything to do with governing our employment have always been negotiated by full-time faculty and administrators with little or no regard for our ongoing and sustaining contribution to the life of the colleges at which we teach. Without us, there would be no school. Period. End of sentence. Join the California Part-time Faculty Association (CPFA) on April 11 at Foothill DeAnza College to celebrate our movement, share our successes, and plan for the future. Go to CPFA.org and register for our spring conference. Sitting at home is not the way to make change happen! There is a lot being thrown back and forth here, and the real problem may be too many cooks in the kitchen. One of whom is Lew Wolff, who indeed wants to run away with the A's to cheaper grounds where the locals will worship his every breath. Dream on, Wolff! As for the Raiders, they have said over and over that they want to stay in Oakland. They keep signing one-year deals to prove it, too. Yes, there is talk (and that is all it is) of relocation to other cities with two teams sharing the same park (ugh, Carson City?) or somehow selling off part of the Raiders to entice a dual ownership investment, but currently nothing is written in concrete. How this can get done is with investment dollars for hotels, retail, restaurants, and some housing to be leveraged against construction and the necessary buyout of current businesses around the park. By the way, has anyone seen the multimillion-dollar BART extension to the Oakland Airport? Can you imagine it connected to multiple hotels? Maybe this was forethought but now it provides a link that can connect all of this right to the Coliseum City site. Now can you imagine this park to be more than sports? Oh maybe a huge convention center? Concerts and more? Now think about the tax revenue those could generate 365 days a year — the labor that would be employed there. And finally the profile of this complex nestled against the bay that touches it. Hmmm ... it makes sense to me. Wonder what Lew Wolff is thinking now that he wasn't thinking five years ago? Everything about Coliseum City is make-believe. There simply isn't enough profit margin between construction costs and what people are willing to pay in rent to live in a third-tier location to have enough left over to finance billion-dollar stadiums. It's not going to happen. Oakland will lose all three of its teams — and I am okay with that. What's up with NPR? Damn, two national NPR-contest winning artists right here in Oaktown — check out Glynn Washington at Snap Judgment. Seems we continue to be at the center of the universe by stepping up with fresh artistry — and it seems NPR is growing new and much-needed wings. So excited to see this new informative column. Kudos to the Express for publishing this gem for all of us who are forming and expanding our families. Really looking forward to Sarah Bethe Nelson's new record, Fast Moving Clouds. I'd also add 10th & Wood. It might even have a better fried-chicken sandwich than Bakesale Betty — not to mention the remarkable pulled pork. These all seem like great places to eat — I for one appreciate the inclusion of an Indian restaurant on 79th Avenue and International Boulevard. That's not exactly the middle of nowhere, but I digress (I would not have expected an Indian restaurant to be there, either). However, I must remind you folks that there was an Oakland before 1999 (gasp! ), and there are many places that would fight a for a spot on a list of quintessential Oakland restaurants and dives that are not mentioned here. Good eats, though! We had a system in place that respected seniority while allowing sites to find good fits. It was called mutual matching, and it was a sort of job fair in which consolidated teachers came to meet with representatives from schools with openings. I have never personally heard of seniority making a bad match — teachers seek schools that suit them. With multiple unfilled openings each year and a 70 percent turnover every five years, let's make Oakland a more teacher-friendly place to work, and that starts with school board member Jody London being a little more teacher-friendly! I had a delicious meatloaf sandwich and green salad for lunch at Communite Table there week. Very relaxed and an un-fussy vibe with a Nina Simone album playing in the background. Bliss! Why Didn't You Talk to the Workers? I wish waiters and waitress would have their time in the sun in this paper! Why are only restaurant owners being interviewed for these articles? Let's hear from the people who are working for minimum wage (busboys, dishwashers, line cooks, etc.)! Also, one of the reasons to work as a waitress is for the tips! Why would we do it otherwise? In all the restaurants I have ever worked in, a percentage of tips went to the busboys, dishwashers, and cooks. Why isn't that standard practice? The public dialogue about the merits of the Affordable Care Act (ACA) and its value to the lives of Americans has varied widely. One side of the debate contends that it kills jobs, is an invasion of privacy, and represents an example of governmental overreach. Meanwhile, architects of the law and its supporters sing its praises based on the belief that affordable healthcare is a right of every American. I share this view. But I'm also outraged by the prospect of being saddled with a bill from Covered California for services that I neither needed nor used. My wife and I have a two-year-old son. We both supported the ACA long before we ever thought we'd need it. We believe that equitable access to healthcare is a fundamental right. Ironically, due to a corporate restructuring, in March of 2014, we found ourselves needing affordable insurance. Thankfully, there was Covered California [the state's version of ACA]. To continue our care at Kaiser Permanente, I enrolled my family in Covered California while I transitioned jobs. The enrollment process was fairly painless, and I paid the Kaiser Family Foundation for coverage through the state exchange for April, May, and June. As healthy people, we had no significant medical visits during this time, outside of general wellness visits or a previously scheduled visit to the pediatrician for our then sixteen-month-old. In May of 2014, I secured employer-sponsored insurance that was to begin on July 1, 2014. As such, I contacted Kaiser Member Services in June to cancel the Covered California Plan. Kaiser indicated they could not cancel the plan. Rather, I would need to directly contact Covered California, which could then give authorization for the cancellation. But it was impossible to reach anyone. So I called again. Then again. And again. After several months, still nothing. The call hold times were interminable. I called mornings and midday. I called in the afternoon. I called from my mobile phone, from our home phone, from my office. Still, no luck. After a recorded message indicating that someone would be with me shortly, either the line would disconnect or I would be on hold for so long that I'd simply give up. It was exhausting. After several months, I turned my attention to the original enrollment counselor. After corresponding via email, she stated that she "did not have authority to cancel it." My wife and I spent several more months calling. Then finally on November 26, 2014, after five months of calls and email, I reached a live person. You can imagine the relief I felt given the emotional investment and concern over months of mounting invoices for a plan that I neither needed nor used. I was told I'd be able to cancel the plan. The representative indicated that there were limitations to the current system that precluded her from backdating the cancellation but based on general public confusion and longer-than-average wait times, that I could rest assured that the plan would be cancelled and the bills rescinded. Per her request, I authored a paragraph that summarized my circumstances and asked for a phone hearing that I submitted via fax to Covered California. That hearing was scheduled for Tuesday March 10, 2015 at 10:45 a.m. In the call, I was asked whether I'd received correspondence from Covered California outlining its position. I had not. After taking a few minutes to sift through my junk email, I was able to retrieve it. Dated Monday March 9, 2015 at 1:22 p.m., it was sent less than 24 hours before the hearing and read, in part: "You have requested that the cancellation date be made retro-active to 6/30/14. Unfortunately, I am unable to assist you with this request. All cancellations are processed on the day the consumer makes this request by contacting the Covered CA Service Center. I do understand that it may have been difficult to reach a representative at times, but there were many opportunities to have this completed since you obtained employer coverage on 7/1/14... ."
The position that Covered California took in the hearing is that my petition for a backdated cancellation has been denied because there is no provision in the law for backdating a cancellation. The issue here is whether the ACA intended to preclude remediation procedures for citizens to accommodate call demand or technical shortfalls. So here I am: a supporter of ACA faced with paying nearly $2,000 for a service that I neither needed nor used. It would be tragic if the story here were that the government intervened in the healthcare market place, ostensibly to save Americans from big, bad insurance companies, only to rip off the very consumers it purports to protect. Our March 11 news story "Another Bruising East Bay Campaign," misstated Joan Buchanan's campaign slogan. It's "Positively for Us" — not "Positively Joan."